TeacherEase provides software for standards-based report cards. Cards are highly configurable to meet unique organizational needs. Each course's standards automatically flow to report cards, no programming required. The online parent portal provides full mastery data. The printing engine can show fewer standards to save paper and simplify data for better parent understanding. Data flows from the gradebook to make report cards accurate and easy. TeacherEase provides a complete software platform for standards-based learning. TeacherEase report card software is specifically designed for standards-based grading. Organizations doing standards-based learning often struggle with report cards provided by their SIS, which typically aren’t standards aware. Customization is expensive and may not work well. TeacherEase provides a complete solution. 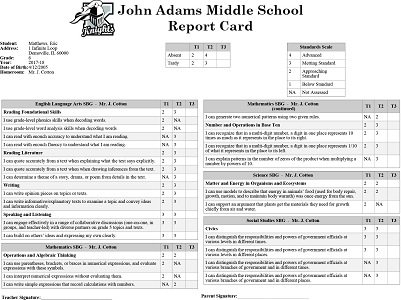 Every organization has unique report cards. This typically includes logos, layout, grading scale, learning targets, etc. These are all configurable within TeacherEase, no programming or consulting services required. Mastery data can be printed on report cards and displayed on the online parent portal. This allows easy access to data for students and parents. One of the first steps in standards-based learning is to write learning targets. They are used to build rubrics, assessments, report cards, etc. Since TeacherEase is a complete system for standards-based learning, learning targets for each course will automatically show up on report cards. Often printed report cards are not the best place to show all mastery data. This consumes too much paper when printing, and can overwhelm parents. The report card engine allows considerable flexibility to reduce the standards displayed. Best practice is to show only high level targets, topics taught this marking period, or areas of instructional focus. Full mastery data is available on the online parent portal. TeacherEase provides a nice user interface for parents to browse standards and understand their students' learning progress. This is a better environment for parents (and students) than looking at paper reports. Scores for individual standards can be combined into overall grades. They can also combined for categories of standards, often called Power Standards, Domains, Strands, etc. When an overall scores is calculated, it can be converted into traditional "A,B,C..." grades and used for transcripts, eligibility, and state reports. Data moves easily inside TeacherEase. Throughout the marking period, teachers collect mastery data with the assessment tool and gradebook. This data flows into report cards, providing accurate information while saving teachers time. Publishing learning data online helps parents understand standards-based learning and appreciate educators’ professionalism. They can watch their own children give effort and make progress. This is especially true when learning targets are written in student-friendly language that's understandable on report cards and the parent portal. During the transition, some courses may be standards-based while others still use traditional grading. Report cards need to support both approaches. With TeacherEase, standards-based and traditional grading are supported on the same report card. TeacherEase has sophisticated import/export and supports open data transfer protocols like IMS OneRoster and Clever. It’s easy to get data in and out of the system. In addition to standards-based report cards, TeacherEase supports a complete suite of tools to support standards in the k-12 classroom.